Island Stylee, the award-winning in-flight video production that has entertained and educated thousands of Air Jamaica passengers over the past 10 years, has touched down safely on the internet. 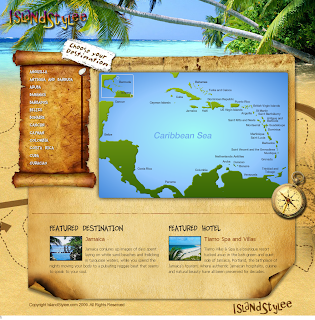 IslandStylee.Com was launched this month at the ITB travel show in Berlin as a virtual familiarization tool for visitors to the Caribbean. "We believe the Caribbean region will benefit from increased exposure now that Island Stylee's video highlights are available on the information superhighway," said Lukkee Chong, chairman of Frame by Frame Productions whose company produces the television show and has launched the website. Chong, who explained that the new website features a "rich and captivating display of Caribbean footage" which Frame by Frame has archived throughout the years, reassured that Island Stylee - the television show - continues to entertain audiences across Air Jamaica's in-flight network, as well as on BET J's Caribbean program line-up which airs on Saturdays across the United States and the Caribbean. The Pan-Caribbean web partnership between the Jamaica-headquartered Frame by Frame and the Miami-based Sonicloop Networks focuses on destinations bordering the Caribbean Sea - from the Bahamas, Cuba, and Jamaica in the north to Trinidad, Venezuela and Colombia in the south. In the Eastern Caribbean, St. Kitts, St. Lucia and Barbados will be highlighted as well as Central American spots to the west like Belize, Costa Rica, Panama and Cancun. "Each destination will have its own presence and personality on the site, providing them with unprecedented exposure to both Caribbean vacationers and vacation planners," said Max Earle, IslandStylee.Com's Director, who reports encouraging response to the soft launch from senior Caribbean tourism officials during their visit to Berlin. The website is being promoted by the Canada-based CMS World Media, marketers of Island Stylee's 45-minute in-flight video, which has gained the coveted reputation of maintaining a waiting list for advertisers throughout the years. For further information, email info@islandstylee.com or visit www.islandstylee.com.